Burma’s Spring: Real Lives in Turbulent Times documents the struggles of ordinary people made extraordinary by circumstance. Rosalind Russell, a British journalist who came to live in Burma with her family, witnessed a time of unprecedented change in a secretive country that had been locked under military dictatorship for half a century. Through her remarkable encounters as an undercover reporter, she unearthed the real-life stories of a rich array of characters and followed their fortunes over a tumultuous era of uprising, disaster and political reform. 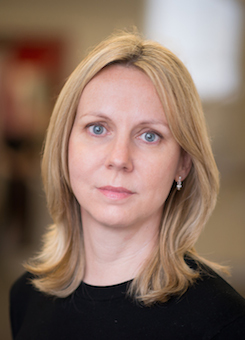 "In her memoir, Russell has written authoritatively of the changes that swept through Burma, yet she has done so by focusing on the stories of a series of individuals and looking at how their lives were affected by events. The portraits are insightful and moving… A richer, more nuanced picture of Burma than is often portrayed by a Western media." "Burma Spring is an extraordinary vox pop exercise that puts you in touch with what people in Burma are thinking and feeling. This is reportage at its best, listening-post reportage where the reporter disappears and all you can hear are Burmese voices. It’s a remarkable achievement." "...finely drawn part memoir, part investigative report about the current social and political climate… as diverse and entertaining as the cast list of any Dickens novel or Shakespeare play… refreshingly vivid… Burma Spring is an extraordinary vox pop exercise that puts you in touch with what people in Burma are thinking and feeling. This is reportage at its best, listening-post reportage where the reporter disappears and all you can hear are Burmese voices. It’s a remarkable achievement. " 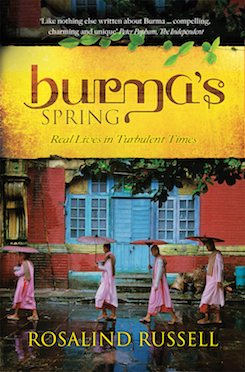 Ros Russell will be discussing her new book Burma’s Spring on Wednesday at the Archway with Words Festival. There’s a terrific review of Rosalind Russell’s Burma’s Spring in the latest edition of the RSAA Journal of Asian Affairs.